One yard can contain several different soil types. Oftentimes, when homes are built, topsoil or fill is brought in to create the yard and landscape beds immediately around the home. Besides a light top dressing and grading and seeding, the outlying areas of the yard are left compacted by heavy equipment. Down the road, when you go to plant something in these outlying areas of the yard, you realize the soil is completely different from the easy to work loamy soil around the house. Instead, this soil may be hard, compacted, clay-like and slow to drain. You’re left with the choice of amending the soil or planting plants that will grow in hard clay soil. 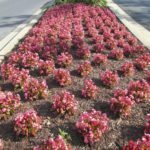 Continue reading to learn more about plants for compacted soil. Many plants are not able to grow in hard, compacted soils. These soils do not drain well, so plants that need well-draining soil may rot and die. Plants with delicate, non-aggressive roots can have a hard time establishing in compacted soil. When proper root development doesn’t happen, plants can become stunted, not produce flowers or fruit, and eventually die. Hard, compacted, clay soils can be amended by tilling in organic materials such as peat moss, worm castings, leaf compost or mushroom compost. These amendments can help loosen up the soil, provide better drainage and add available nutrients for plants. Raised beds can also be created in areas with hard clay soil with better soil brought in to create a depth that plants can spread their roots in. Another option is to choose plants that will grow in hard clay soil.